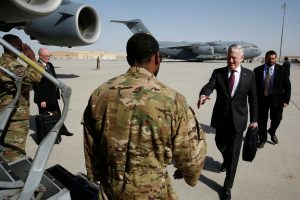 DJIBOUTI — U.S. Defense Secretary Jim Mattis on Sunday visited Djibouti to bolster ties with the tiny and impoverished African country that is home to an important base for U.S. counterterrorism forces, including drones. Mattis, the first Trump administration official to visit Djibouti, planned to meet with President Ismail Omar Guelleh and greet U.S. and French troops. He was accompanied by Marine Gen. Thomas Waldhauser, head of U.S. Africa Command. The U.S. operates drone aircraft from Djibouti for surveillance and combat missions against al-Qaida-affiliated extremists in Somalia and elsewhere in the region. China is building a military base in Djibouti, a former French colony in the Horn of Africa. For years the U.S. has operated a fleet of armed drones, initially from Djibouti’s Camp Lemonnier, where French troops also are based, and now from a separate airfield. Djibouti took on added importance to the U.S. military after the Sept. 11 attacks, in part as a means of tracking and intercepting al-Qaida militants fleeing Afghanistan after the U.S. invaded that country in October 2001. Djibouti also has been instrumental to international efforts to counter piracy over the past decade. Mattis’ predecessor at the Pentagon, Ash Carter, never visited Djibouti during his two years as President Barack Obama’s defense secretary. Over the past week Mattis has met with leaders in Saudi Arabia, Israel, Egypt and Qatar. In Doha, Qatar’s capital, he told ruler Sheikh Tamim bin Hamad Al Thani on Saturday that he would personally tend to the relationship. “Your highness, relationships get better or weaker, and I’m committed to making it better from our side,” Mattis said. The U.S. has a fleet of fighter, bomber, transport, surveillance and refueling aircraft at Qatar’s al-Udeid air base, which also is home to an operations center that coordinates U.S. air missions throughout the Mideast and in Afghanistan.